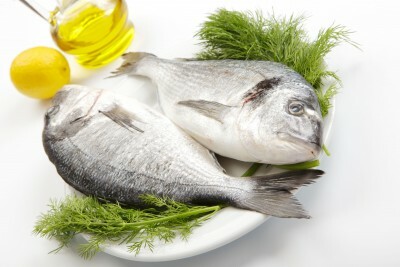 Place the fish in a glass baking dish large enough to contain it in one layer and sprinkle the fish with the lemon juice and season to taste. Peel one tomato and’grate’ through the large holes of a box grater into a bowl to catch the pulp and juices; add the tomato paste (thinned in a bit of water), garlic, parsley, olive oil and salt and pepper. 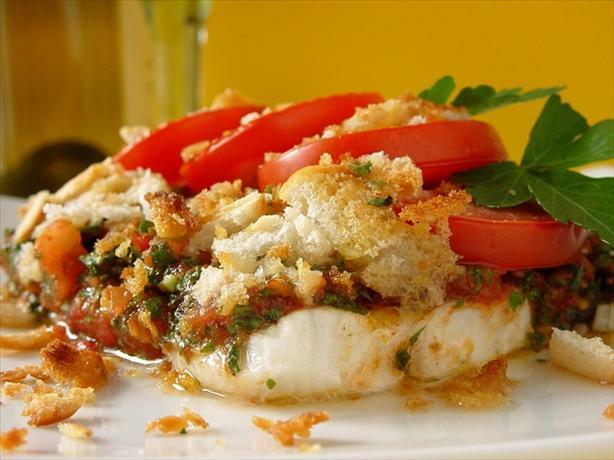 Pour the tomato mixture over the fish. 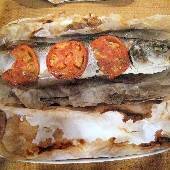 Slice the other tomato in thick slices (if using tinned tomato, you can forego this part), place the slices over the fish and top with the bread crumbs.